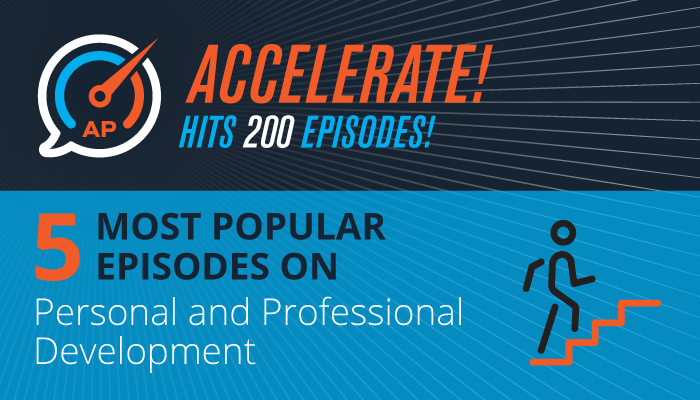 This article is part of my series about the Top Most Popular Episodes from Accelerate’s first 200 episodes. If you want to maximize your personal potential in sales, you can never stop learning and growing as a person, and, as a sales professional. Invest some time to listen to my conversations with these world-class experts about the steps you should take to amp up your skills and capabilities. Townsend Wardlaw is a sales transformation architect. In this episode, he talks in depth about the fears that paralyze many sales reps and provides effective strategies they can use to overcome them to transform their sales results. Everyone in sales has fears about some aspect of selling. But they don’t have to hold you back! You definitely want to listen to this episode. John Smibert, is the co-founder and CEO of Australia-based Strategic Selling Group. John is on a mission to elevate the professionalism of sales. Tune into this episode to hear John and I talk about how to avoid the pitfalls associated with too much reliance on automation in sales. John also spells out a modern approach to sales training that sales managers should use. In this episode, Kraig Kleeman, author, speaker, consultant, and expert in cold calling/prospecting, discusses how using proper language strategies can increase the quality of persuasive sales tactics. John Murphy is a European-based executive coach who works with senior executives, business owners, and management teams to help them achieve their business objectives. In this episode, John discusses how to bolster your emotional intelligence and how to find motivation, purpose and success beyond just making money. In this episode, Colleen Stanley, CEO of Sales Leadership, Inc. and author of the best-selling Emotional Intelligence for Sales Success, discusses what it takes to manage and master your emotions to become a top performer.